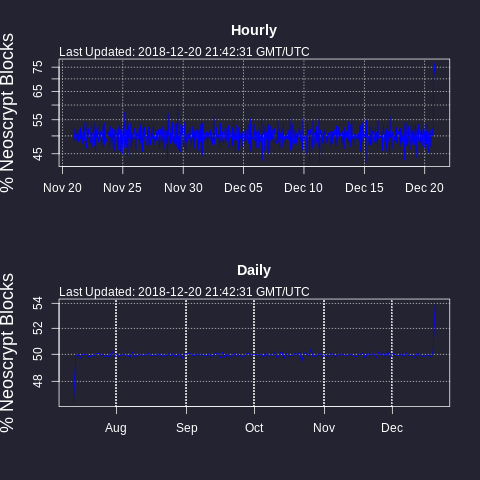 This is because the hourly level takes into account how many blocks are actually mined during that time, while block-level is based solely on the difficulty (there is no time to average over). But look at whats happening to the percentage of each block being mined (attached). Did I read somewhere the expected ratio was supposed to change during this fork as well? I think I found it. I'm calculating the hashrate like above. I think the problem is in the denominator for the HR_est. After block 440k, it is now supposed to be 3/4 neo right, so the denominator is wrong?